projects when local groups visit during this year. Once again this annual event was lots of fun and a huge success with about 60 participants. 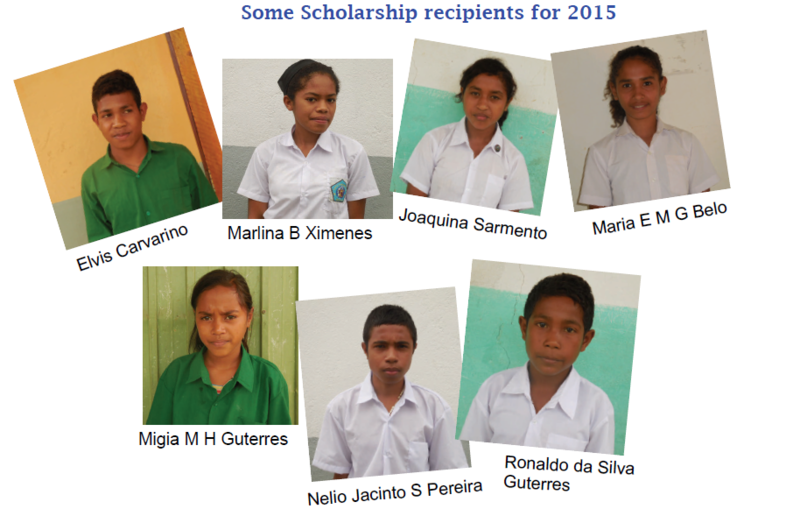 Just over $2000 was raised for the scholarship program which enables students in Venilale to continue their education. Activities like this are also allowing for an extension to this program in the form of trade and medical scholarships. Thanks to the landholders, the organisers: Helen and Andrew Crockett, Kath Davey, Margie Twycross, Jenny and Dave Dunlop, Rotary for the BBQ and Nessie for the music. Generous donations from Mary Parker in the form of hand knitted hats, head bands and heat bags, Ann Eldred for camellias and Rhonda Carpenter for strawberries certainly made a difference. Special thanks to Julie Warren for providing her expertise in redesigning the stall to make it more attractive. A student from the Secondary College also helped out and over $500 was raised. Students are fundraising by selling sheep and chook manure. Their special cause is their sister school, Bercoli Junior High. Darcy Croxford-Demasi, Annabelle Fox, Sophie Monichino and Chloe Morrow will visit Venilale in the July school holidays. 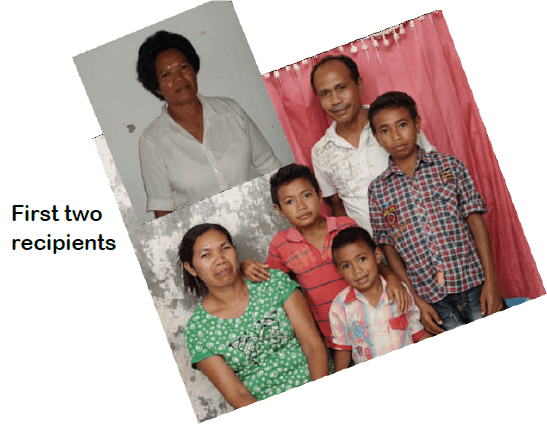 Since early 2013 the weekly contributions of $2 or $3 from this group have paid for the training of three nurses in Venilale, East Timor. Claire Owen has boosted donations by asking members of the group to make a donation as thanks for all the produce she so generously brings e.g. quince/plum paste, jam, pickles, figs, apples and other bounty from her garden. profits. $4000 was raised which will make a significant improvement to the lives and education of the 120 girls housed at the orphanage. We look forward to a full report in the next newsletter from Ann, her friend, Katy Brumley, and 14 year olds Katy and Zarah who will be visiting Venilale in May. 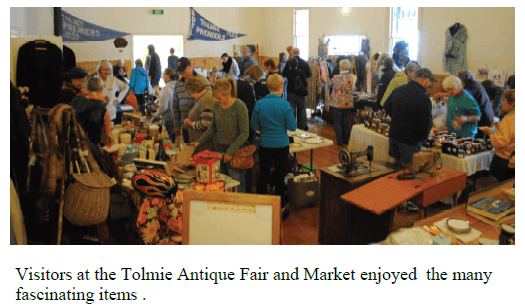 The 6th Tolmie Antique Fair coordinated by Marg Attley, was a great success despite the very wet weather. A wonderful atmosphere was created by Jamie Beckingsale, the auctioneer, and nearly $1300 was raised for the needs of the Venilale community. 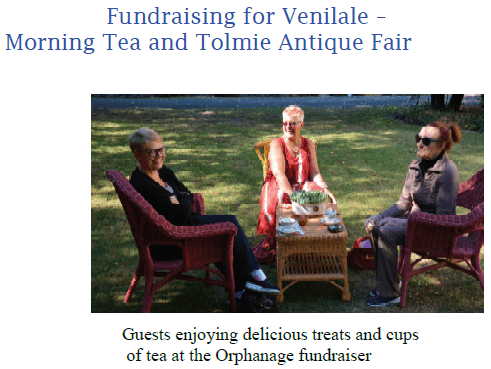 The Tolmie ladies supplied delicious scones, jam and cream. 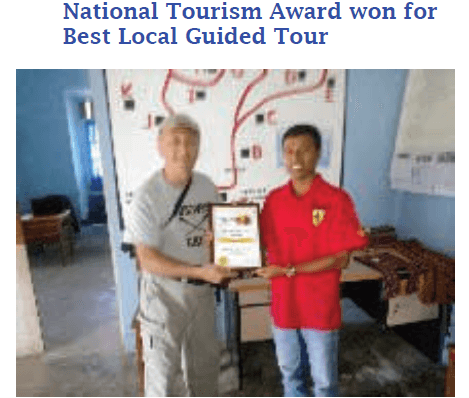 Timor Adventures, the main Tourism company in Timor Leste, presented their National Award for Best Local Guided Tour for 2014 to the Venilale Walking Tour. This is predominantly the work of Joni Sarmento who has built up this activity from an informal walk to a highly polished and well documented, not to be missed tourist activity. Joni is now the Friendship Liaison Officer so Ernesto Guterres, pictured below, has been appointed to replace Joni. Pedro de Sousa who stayed in Mansfield for 3 months in 2005, is the Education Support Officer and Boss, pictured on the next page is the official translator. Friends of Viqueque is auspiced by the Greater City of Geelong and is supported by a range of local businesses and a well organised and coordinated structure of public, Catholic and private schools. As well as being friendship towns we also share our ‘brother’ Joanico Sarmento who is Venilale’s Friendship Liaison Officer employed by Mansfield, and a very prominent ex student of Viqueque’s Catholic Secondary and Geelong’s’ Christian College. When I heard that Geelong’s Christian College teachers were organising their bi annual teachers seminar in Viqueque and they had a spot vacant I jumped at the chance! What could a TAFE teacher with a community services background do? As well as sessions in Public and Community Health, adolescent development, lesson planning and evaluation, there was a session for female teachers about the political, economic, health and community context for young women and menstrual hygiene management. Every young woman potentially misses five days a month from school. That’s 60 days a year away from learning. Teacher, Marita Thurman, from Christian College had 100 ‘Days for Girls’ packs made by a sewing group in Drysdale for distribution. The model of ‘teacher to teacher’ was fantastic and also added a way to strengthen partnerships. 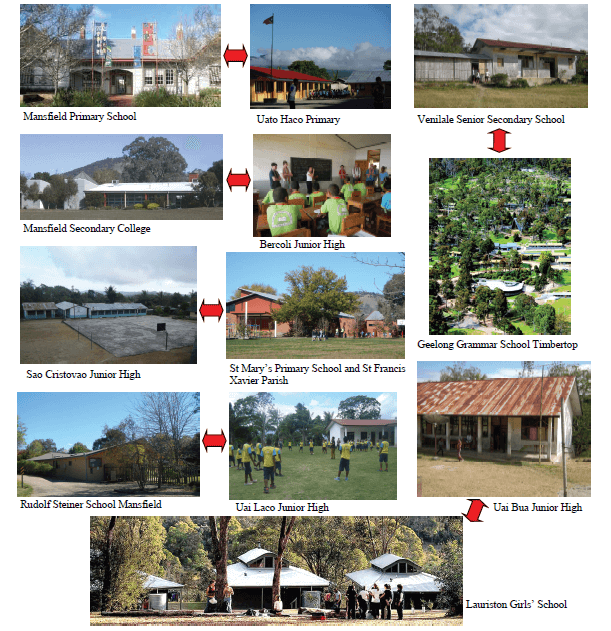 Teachers and group work leaders in Mansfield, watch out – you will be targeted for future trips to East Timor! The unstoppable Mr Andrew has offered to support the redevelopment of the Mansfield/Venilale Centro Comunidade into a guest house. Viqueque’s Friendship Liaison Officer ‘Sinto’ loves the Venilale Community Centre and sees nothing but growth and potential options so another trip and future project beckon. The Community Centre supported by Mansfield operates as a tourist house, product sales for women’s crafts and weaving from Feto ba Dame, internet, printing and computer resource. The Centre is looking very professional and the gardens have been maintained well. 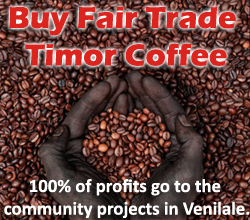 There are so many ways to be involved in East Timor, from participating in your local friendship group and its activities, being part of METAC – Melbourne’s East Timorese Association, but more importantly going to Timor and experiencing everything the country has to offer. 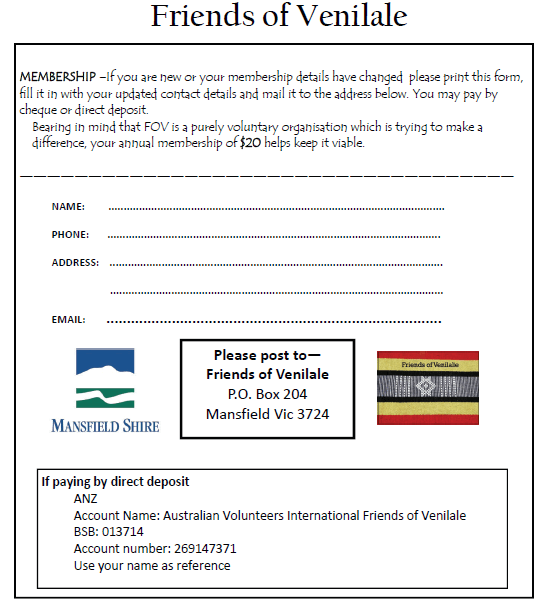 The Friendship Partners Project is a wide-reaching initiative linking community organisations with likeorganisations so that all facets of the Mansfield community can have levels of connection with the residents of Venilale. Such village to village contact is integral to pathways towards peace and justice in the world. 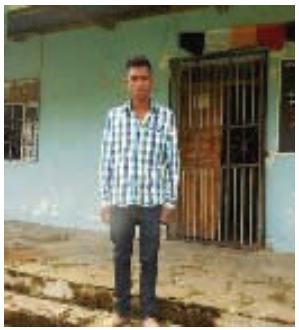 Venilale has made significant progress since independence in 2002, but with the average income around $1.00 per day, there is much that the Mansfield community can do. A Friendship link does not require large-scale assistance, but it does mean an ongoing, permanent relationship with the associated responsibilities of contact. Such assistance will be part of a Mansfield community response to an observed need of our closest neighbour. Some Friendship Partners choose scholarships as their main vehicle of support and contact. Julie Aldous, the coordinator of the Project, also plans to establish a collection of Timor Leste resources at the Mansfield Library for partners to use. Each school or church group has been asked to assemble a small package of materials as an introduction to the principal, staff and students of their partner school. These will be delivered by the 4 students, staff member Mauz, and leader, Julie, when they visit at the beginning of July.